Minister of Industry and Trade, Tran Tuan Anh has vowed to revoke licences of hydro-power projects which violate regulations. During a meeting about the operation of hydropower reservoirs, Anh praised the achievements of the sector, saying that it had done well in the past 6 years. However, the reservoirs are posing risks to communities downstream. Anh said they must face the truth and recognise shortcomings to fix the problems caused from unsafe operation and minimise possible damages. Tran Van Luong, director of the Industrial Safety Techniques and Environment Agency, said there were some residential areas and cultivated lands located on the drainage corridor. But the communication between the reservoir managers and local authorities has been poor, resulting in delays and frustration from the local people. 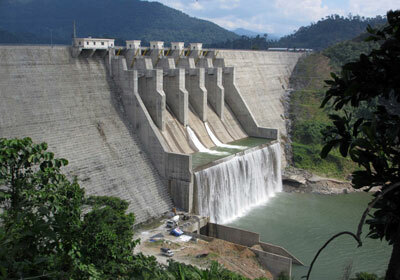 In many cases, the reservoir management have failed to do any emergency scenario preparations and were slow in reacting. "Ministry-level management agencies and local authorities haven't fulfilled their responsibilities to raise people's awareness and issue guidance on inspections and punishments for violations. Minister Tran Tuan Anh said investors and local authorities both must take responsibilities over reservoir discharges as multi-reservoir operation is an urgent issue and they still had no clear solution. "Projects that may badly affect people's lives must be reconsidered. Projects that are deemed to be low quality or lack legal basis. We may revoke project licenses if investors violate regulations and heads of local flood and storm control committees may be punished," he said. There are opinions that government must tighten management over hydropower projects as many incapable investors have been selected and there are investors didn't follow procedures in surveying, designing to operating. Anh admitted the responsibilities and the collaboration between agencies was vague and lacking. "Shortcomings have been exposed in discharge routines. Assessments from the Ministry of Industry and Trade and the Ministry of Natural Resources and Environment and other agencies show that there are problems in the state management system, especially consultancy roles from departments to local authorities," he said. According to Anh, many shortcomings can be seen in the directives of each locality in relation to flood prevention plans or the role of the dams in flood and storm prevention plans.